Welcome to the website and blog of Elisabeth Storrs, author of the Tales of Ancient Rome, an historical fiction series set in the early Roman Republic and the little known civilization of Etruria. The saga follows the lives and loves of three women; Caecilia, Pinna and Semni, who must survive a ten year siege between two bitter enemies with courage, wit and wiles. The Wedding Shroud was endorsed by Ursula Le Guin and was judged runner up in the 2012 Sharp Writ Book Awards. 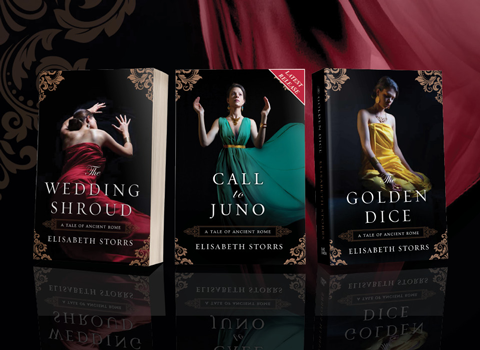 Endorsed by Sherry Jones, The Golden Dice was named as a top memorable read by Sarah Johnson, reviews editor for the Historical Novel Review, and was a first category winner in the 2014 Chaucer Awards. Elisabeth’s latest book, Call to Juno, was endorsed by Kate Quinn and Helen Hollick, and was selected as an Editor’s Choice in the Historical Novels Review. Check out Elisabeth’s Triclinium blog for reviews, interviews and posts on historical fiction and history. Elisabeth would also love you to connect with her on social media or contact her. 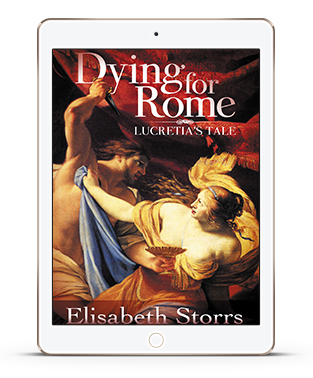 Elisabeth is offering a FREE copy of her short story, Dying for Rome: Lucretia’s Tale, when you subscribe to her newsletter. Check your inbox for a message to confirm your consent to add your email address to my subscription list. You will subsequently receive directions how to download your gift of Dying for Rome. Signup for monthly inspiration, news, and giveaways. You will also receive word of new releases and occasional promotions. I hope you enjoy your gift of Dying for Rome: Lucretia's Tale. Please confirm your consent to allow Mailerlite to retain and use your data so you can receive emails from Elisabeth.